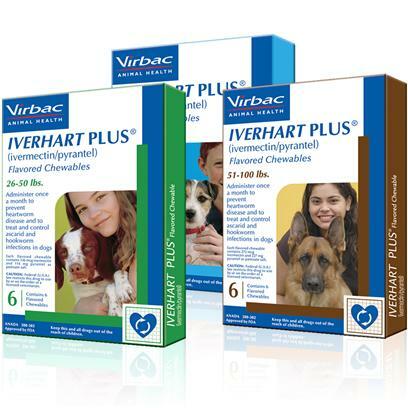 Iverhart Plus (generic of Heartgard Plus) is an effective, chewable heartworm prevention medication that also works to prevent roundworm and hookworm. The ingredients, Ivermectin and Pyrantel Pamoate, kill the parasites but are safe for dogs and pups 6 weeks and older. Iverhart Plus is available in delicious pork liver flavored chewable tablets your dog will love and comes in monthly doses. Side effects can include vomiting or diarrhea within 24 hours of dosing, as well as depression/lethargy, loss of appetitie, staggering, convulsions, and hypersalivation. Herding breed dogs have been reported to be more prone to experiencing the side effects of Iverhart Plus. Administer Iverhart Plus once every month. The tablets are intended to be chewed, not swallowed. Break the tablets up, if dog does not want to chew. Iverhart Plus can be given to your dog by hand, mixed with a small amount of food, or placed in the back of your dog’s mouth for forced swallowing.